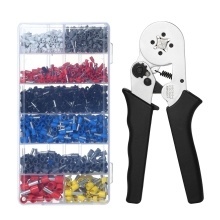 Complete Crimp Tool Kit: 0.25-10mm² self-adjustable ratchet wire crimping tool with 1200pcs insulated wire terminals kit. Ergonomic Handle Design: Non-slip PP&TPR handle, using the leverage theorem, comfortable and energy-saving. Self Adjustable: This crimp tool can automatically adjust to the appropriate diameter for crimping. Sturdy spring design assists during use and the locking clip keeps the tool safe and closed for storage.